"YOUR COMPLETE AUTOMOTIVE RESTYLING CENTER"
Upholstery Limited is a family owned & operated business. We have been serving the Baton Rouge area since 1976. We pride ourself on customer service, & providing customers with the best products on the market. Experience is a must in this industry, & we have it. 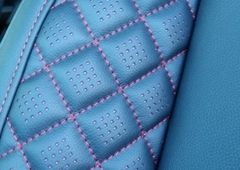 We have a combined 140 years in automotive upholstery. We look forward to many more years of serving Baton Rouge. This was the best upholstery job that I have ever had done to a vehicle. Dale jr and Dale sr are professionals. Fast friendly service. Great communication no hassle business. Definitely recommend them to anyone needing upholstery done in there vehicles. Dale Jr. took very good care of my truck. Thanks to the staff of professional who worked on my truck.I love it and everyone who gets in my truck love look and style. Replaced and what did not. Thanks to everyone who worked on my car. The owners is very knowledgeable about their product. They are friendly and courteous. 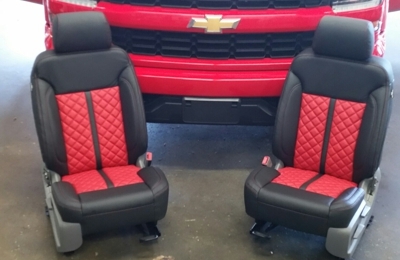 Upholstery Limited put black and red leather seats in my husband’s truck, and they look AMAZING! Turnaround time was quick, and I’d definitely use this company again. Great job. Quick and easy. I came Monday morning and had new leather seats by 3:30pm. I would highly recommend them to anyone! Took my 2011 F-150 in to Upholstery Limited for new leather seats. Installation was one day in and out. The work was better than factory. The interior of my truck looks new. Staff was very knowledgeable and friendly. If you need leather work done in the Baton Rouge area this is the place to go. Just a little side note. I had a very minor problem with the installation, took it back and the problem was taken care of within 15 minutes. Customer service was excellent.
. Awesome service at Upholstery Limited! I’m very pleased with my experience at Upholstery Limited!! Professional and quality service in a timely manner. The customization is outstanding! Same day service is the best! We purchased a new Tahoe before Christmas and wanted to upgrade the seats to leather. I contacted Upholstery Limited and they were able to accommodate me the next date. I brought my vehicle to them and they had everything completed the next day and did a beautiful job. I would highly recommend them to anyone interested in getting anything recovered. I am very satisfied. "Ask for Dale Jr."
Had my 2014 Dodge Durango seat done at Upholstery Limited from cloth to leather, seats came out excellent. Love the work they did, 1 day they had our truck ready . I highly recommend you try them out. I will do business again with my next vehicle. Dealer recommended Upholstery Limited for the change of cloth seats to leather seats on my new 2017 F-150 4 x 4. U/L made the change in one day with the completed seats looking better than the factory leather. Very pleased with the service and the product from Upholstery Limited. Very very pleased with the outcome. Dale Jr is very knowledgeable about his product. He showed me many options, and what he thought would look best. We went with his suggestion and I'm very pleased. My experience with Olano's Upholstery was amazing from start to finish. Always helpful, response was always prompt and understanding when I had crazy questions, and the outcome was nothing less than flawless and perfect!! Will definitely do business here again. We welcome &quot;crazy question&quot; when it comes to leather designs, you never know what&#39;s available till you ask, when it comes to different designs of your leather interior, we are on the cutting edge, thanks again for your business, Dale Sr. Excellent selection of materials; outstanding installation of the seat covers; answered all questions and explained how to properly care for the seat covers. I was very impressed with my leather seats. They turned out great! Also, great people to deal with and would highly recommend to anyone seeking leather upholstery services for their vehicle. Thanks again for the business. We hope your enjoying your LIMITED style Leather Interior in your new F-150.